Although I’ve had the iPad for more than a year, I haven’t tried using a stylus until only recently. A stylus is not necessary in order to make the most out of touch screen device (even Steve Jobs thought so); many people never even consider them, and their user experience remains excellent. Nonetheless, the market is full of different kinds of styluses, and the recent popularity of drawing apps such as Paper Introducing Paper, A Simply Beautiful Sketchbook App [iPad] Introducing Paper, A Simply Beautiful Sketchbook App [iPad] Paper by Studio Fifty Three (iTunes link), which is admittedly a rather un-Googleable name for an app, is the ultimate in distraction-free simplified idea sketching. Your options are ridiculously limited - but that's part of... Read More and Draw Something has increased their sales dramatically. In their favor, writing and sketching does become easier with a stylus, you can use them even when you’re wearing gloves, and they can help keep the screen clean of finger smudges. Today, I will be reviewing 3 kinds of styluses from three different companies. The first is the Griffin GC16040 stylus, the second is the TouchTec II 7mm stylus pen, and the third is Amazon’s own AmazonBasics stylus. I will be checking how each stylus performs in different touch-screen tasks, how comfortable each stylus is to hold and use, and at the end will give you my own conclusion as to which of these three is the best, and which one would be the best buy for which task. In addition, we’ll be giving away 5 sets of all three styluses to five lucky readers (each winner will receive all 3 styluses)! Let’s see how they fared on my 1st generation iPad. The Griffin GC16040 ($9.99 on Amazon) is supposed to be easy to use whether you’re right handed or left, and whether you’re writing from left to right or from right to left. This is a 8mm stylus which comes in a variety of bright colors. It’s 11cm (4.3″) in length and weighs 15g (0.5 oz). It comes equipped with a silver clip for attaching it to a pocket or a strap, just like a regular pen. The Griffin has a matte finish, which makes it easy to grip without having it slide out of your hand. It comes in a relatively small cardboard packaging which is very easy to open, and includes a simple plastic tray on which the Griffin rests alone. Nothing else is included in the box. The Griffin’s packaging is just the right size, and includes useful facts about the stylus on its back. The TouchTec II ($14.95 on Amazon) is supposed to offer perfectly balanced weighting and precise and accurate note taking and sketching. This is a 7mm stylus shaped more like a regular pen. It’s 13.5cm in length (5.3″) and weighs 17g (0.6 oz), with a glossy, more slippery plastic finish. It comes with a regular pen clip and a small gimmick: when you twist the stylus to the right, a real ball point pen emerges from its non-stylus end. This means you can carry the TouchTec around just like a regular pen, and turn it around to use the stylus end whenever needed. It’s even possible to change the ink cartridge. The TouchTec II comes in a small and economical cardboard tube which looks somewhat unpromising. Upon opening this tube, though, you’ll find a fancy plastic case, complete with a lid and a velvet-like lining. The case is a great place to keep the stylus when carrying it around, and really made me feel like someone cares about me (and my stylus). Unfortunately, the way the case is packed leaves both ends very vulnerable, and indeed, this case seems to have been damaged on shipping; I received the case with a little hole in the plastic. Someone even placed some tape on it, in hopes I wouldn’t notice. While this in no way affects the stylus itself, this beautiful box might call for better packaging. The AmazonBasics ($10.88 on Amazon) is a 8mm stylus, and is very similar in shape and size to the Griffin. It’s 11cm (4.4″) in length, which is about the same as the Griffin, but weighs only 11g (0.38 oz), which is 4g less than the Griffin and a full 6g less than the TouchTec. It has a matte finish, which makes it easy to grip, and comes with a string attached to its back for tying onto things. If you’re wondering what the piece of plastic at the end of the string does, so did I. Apparently, it does nothing, at least as far as I could see. No standard clip on this one. The stylus comes in a huge Amazon “frustration free” package, which was indeed very easy to open, but seems like an unnecessary waste considering the only thing you’ll find in this huge box is this small stylus, which looks tiny in its surrounding, and a warranty booklet. All in all, these three styluses provide a nice range of different approaches to building a stylus. The Griffin and Amazon are very similar in general build, but differ significantly in the length of the rubber tip and overall weight, while the TouchTec is longer and heavier than both, with a narrower build and a different weight balance due to the pen. Writing is possibly one of the first things people want to do with a stylus, but unfortunately, all three of the styluses I tried were not brilliant in this respect. As long as I was writing in a nice and slow pace, all of the styluses kept up, but once I got the hang of it and started writing in my usual pace, they all started stuttering. Nonetheless, one stylus stood out as the best of the bunch. The Best: In the writing category, the Amazon stylus takes first place. It’s slightly longer rubber tip glided effortlessly on my iPad’s screen, and its light weight made it very easy to hold in several different writing positions. This stylus was the most accurate of the bunch, and kept up with my writing even when I started increasing the pace (up to a point). It was fairly comfortable on both LTR and RTL writing (although less so in RTL) The only real problem was its unexplained string, which kept getting in the way. Luckily, the string can be easily removed. The Worst: In this category, the honor goes to the Griffin. The main reason for its poor performance is the unfortunate stickiness of its rubber tip. The Griffin’s rubber tip likes to latch on to the screen, and is pretty hard to glide across it. This makes it almost impossible to write in a normal pace. Granted, if you’re into writing very slowly, drawing your letters one by one, you can get some impressive results from the Griffin, but it’s uncomfortable for regular-paced writing. The TouchTec fared fairly well for writing, it’s pen-like shape is very comfortable to hold and it’s thin rubber tip glides nicely on the surface. It was a bit slow to respond, so when I started writing faster, it had trouble keeping up. Drawing, sketching and painting is the best part of having a stylus, and its accuracy is usually far superior to that of your finger. The case wasn’t much different here, and all three styluses did a nice job with drawing. Some were better than others, though. The Best: The TouchTec stylus is the best artist of the bunch, and provides a very nice experience when drawing, painting and sketching. It’s relatively short tip provides just the right amount of resistance, and its weight is ideal for stabilizing your hand, while not crippling its movements. I’m no artist by any means, but I loved doodling with the TouchTec, and filling areas with paint is pretty effortless as well. The Worst: Once again, this one goes to the Griffin. It’s too bad, because the Griffin is not a bad stylus, but its overly gripping tip makes it impossible to really enjoy working with it. You can definitely draw and sketch with it and even get some good results, but it’s simply harder to use than the other two, which makes it the worst one in this category. The Amazon stylus did very well for drawing and sketching, but its light weight made it just a bit harder to use than the TouchTec. If you already own a stylus, why not use it all the time and avoid smears and smudges from oily fingers? A stylus can be used for just about any task the doesn’t require more than one finger, and I found that it’s really handy for plain old browsing and typing, as well as casual games such as Solitaire and Mahjong. In this category, there are no best and worst, as all three styluses performed really well. Scrolling, dragging, typing and clicking all worked very well with the styluses, and surprisingly, I found that my browsing and gaming experience on the iPad suddenly became even better. Using a stylus for browsing not only makes you more accurate, which makes clicking small links much easier, for example, it’s also faster; your finger is suddenly long and sharp, and the whole experience becomes, well, almost magical! The TouchTec does have a slight advantage if you’re using it on a smartphone: it’s narrower tip makes it very easy to use it on a phone’s small keyboard with maximum precision. The other two, which have slightly wider tips, are somewhat less accurate on the small keyboard, but perform well on a tablet. Assuming $10-$15 is the price range you’re looking at, I would highly recommend buying the $14.95 TouchTec II stylus pen. It has a perfect balance between grip and glide, it’s responsive and easy to use, and owning it can really enhance your overall tablet experience. In this price range, the AmazonBasics stylus is also a solid buy. Unfortunately, at this point I would recommend skipping the Griffin. Of course, if you’re willing to spend just a little bit more, there are other choices around such as the stylish Wacom Bamboo (around $29, depends on color) or the highly popular Cosmonaut ($25). We’re giving away 5 sets of all three styluses so that you can judge them for yourselves. This review set is included in one of the five sets. Interested to be in the running to win these 3 styluses? Here’s how to join. How do I win these styluses? Congratulations! If you were selected as a winner, you would have received your license via email from jackson@makeuseof.com. If you require any assistance, please get in touch with jackson@makeuseof.com before Aug 7. Enquires beyond this date will not be entertained. This giveaway begins now and ends Friday, July 27th. The winners will be selected at random and informed via email. Explore more about: Drawing Software, MakeUseOf Giveaway, Writing Tips. we bought a cheap version for .70 cents ^_^ but this one looks way better. Hope I win. Fingers crossed. My sister has one with the rounder tip for her iPad, and when I used it, I didn't find it to be quite as accurate as my finger. I use Wacom Bamboo and I love it! But I do wish if I could have something with a finer tip. Sometimes the stylus responds better than a greasy finger. Great when reading tablet during lunch! What is the working principle of these Styluses? I knew capacitive screens detect the ions in our blood but how do these work? Without getting too technical, these styluses have a conductive tip, which turn them into sort of an extension of your fingers. More and more great giveaways, thanks! Luv makeuseOf. Great reviews... which I can actually use! Often find myself making recommendations to friends to check out MUO. Here's hoping that South Africa will also feature on the winners list. stylus is just what I want for noteshelf, got to be better than my finger !!! I believe it's simply to aid in untying the string when you "loop" (or tether) it in order to attach it to something (ie: your tablet, phone, briefcase, purse, etc.). If it's long enough to do, that is. You should be able to pull that plastic piece in order to loosen it or grasp it easier to untie....instead of trying to use your fingernails nails to pry the string loose. Many things used to have those attached some time ago. You could also buy more "fancy" ones for that added touch such as chains and add charms. The old pagers and most cell phones had a hole on the corner where one could thread through a tether string like that....cameras usually have one (especially the small cameras)...some cell phones still have the hole in order to use a tether string such as what's on the stylus'. Many times those plastic pieces slide to shorten, or tighten, the string to make it more secure. Anyhow...would be great to win and good luck to all that enter! Thanks for clarifying that, Chris! Hope I can win in Denmark as well!? nice giveaway. Would like to get this one. I was told this is great for iPhone users. I wonder if it would work on Galaxy Pocket? Yes, these should work fine on the Galaxy Pocket. Please count me for the giveaway contest. I had never thought about using one until reading your review. Thanks! Styli are the way to go. I love the TouchTec, the also have a slimmer one out now. I use it a lot to take notes in meetings, then transcribe them into documents. Is there an iPad stylus? And.. am I the only one worried that I would use the ballpoint end on the iPad?! I saw one somewhere....don't ask where because I have no idea and could kick myself for not getting it then....that is rubber tipped, of course, but is shaped like a pencil on the end. i have a touchscreen Mp3 player that it would be perfect for, and have not been able to find one since the one I saw and passed up. I have tried alot of stylus pens and they all seem to not perform the way its promised on package when bought. Maybe, and I hope this one is different. May have missed the boat on this one. I use and highly recommend a "Jot Pro" from Adonit. It was more money but the fine point riding on a clear disc makes the writing and drawing much easier than the rubber tips. I would love to try a stylus, it seems pretty easy but you have to have the program to use it with. I have used a stylus before and with the right program it makes life easier. Would like to try a stylus, don't use one now but I have on some programs and it seems to be very easy. I would love to try it out. There's been a review of styluis's for a while now, *Good Job* ! I have the Amazon basic stylus and like it quite a bit, but am really puzzled by the plastic thingy. There's actually a rather active discussion on Amazon about this thing (we're calling it a dongle). Nobody know what it's for, and Amazon has never commented on it. I'm a UK resident and always thought Make Use Of was a UK operation, seeing as how the address of its emails is Colchester, Essex. Yet time and again the MUO material I'm emailed, such as this stylus article, is priced in US dollars. There have also been times when MUO has referred to products that aren't even available in the UK. It would be nice to be assured that this latest MUO prize draw is open not merely to US residents, but everyone else in other countries, too? This is to confirm that our Giveaways are open worldwide. MakeUseOf is based in the UK. However, prizes and prices are often provided by companies located in the US. Also, the majority of our readers are from the US. Hence we go with the US Dollar price tag. Nothing like using an iPad with a stylus. I really enjoy reading MakeUseOf. Its very Informative & interesting. 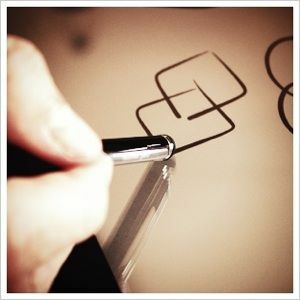 I have never used a styluses, but can see where it would be useful and fun. Would be great to try them out. Thanks for the reviews! Would love to win them since everyone says you have to try out a lot to figure what is good for you. I recently ordered the Hand Stylus and am awaiting delivery. Would love to try one with my phone. I have a Targus stylus and a nomadbrush. The nomadbrush is a soft paintbush with capacitive fibers instead of hair, and it is absolutely fantastic for painting on the iPad. I have an artist friend who is able to make very good professional paintings with this brush and the ArtRage app. Might be worth reviewing some of these alternative sylii. How do these stylus perform when a screen protector, such as Zagg is on? Any variances? I don't have a screen protector on my iPad or phone, so I can't really say. Sorry! I know the guy doing this Stylus on Kickstarter! It is high cost but also very high quality! Would you spend this much on a stylus? Great review and giveaway count me in please and thanks. I have entered and I hope I win. I use a stylus everytime I pickup my phone. My fingers just don't fit the phone. I love the better control I get with a stylus. The cheap ones I bought seem to break easily. This one seems to be of good quality. Currently I've a small, short and no brand stylus which is not very responsive. Maybe winning one of these would be a great replacement. Thanks, MakeUseOf!! I'm constantly on the lookout for a decent, long-wearing stylus to use with my iPad 2. I do quite a bit of art/graphics work on the iPad, and I tend to go through stylii quite quickly. I'll give your top picks a try and see how they do. Where is the giveaway code? and click on "Giveaway Codes" link. My only issue with the reviewed styli, their thick tips! The TouchTec is not very thick, actually. They were all pretty accurate with small things too, even with the wide tip. I sort of filled out the entry stuff and then spent points on accident :/ does this mean I have 2 entries or just one will be ignored? recently i bought a Samsung Galaxy tab 10.1, I am still new to tablet computing so I have a lot to learn about them, this particular tablet runs Android 3.2, I am eagerly awaiting the ics to be released before getti g to far into the inner workings of Android. I have read the above review, which was very informative, however I am unsure as to whether any of these stylus would be compatible with my tablet. Yes, all these styluses will be compatible with your Galaxy tab. Good luck! Lovely - I got used to a stylus when I had a PDA and still prefer them. I see that the TouchTec has a clip (like the Griffin) but it's located at the stylus end (as opposed to the pen end). Does this get in the way at all when you flip it over to use the stylus? A great companion for tablet. I get my styluses from trade shows. I was looking for which one would be the most durable. I have gone through quite a few playing games and none seem to last more than a week. The tip will always blow out like a tire. Wow, that's impressive. :) That didn't happen to me, but I didn't really apply a lot of pressure on any of them. If you haven't tried a Jot stylus from Adonit, you don't know what a good stylus is yet. It is literally the only stylus (I've tried 10+ and own 6 different ones) that I don't dislike for multiple reasons, and is by a wide margin the best writing, drawing, and painting experience I've had on my iPad. They are even making a bluetooth pressure sensitive version soon. Cool, thanks! I haven't tried it, but will remember the name. Excellent review, Yaara! I want all of them :) Followed all the steps of participation, google +ed you with the same gmail account, now let's see if I win them. Cheers! does this work on samsung galaxy s3? Do you have a fine tip version in the works? Several people I've come across would like one with a fine point similar to the size of a ball point pen to be used with their favorite point of sales apps like Square etc. for customers signatures.? Is the one with the ball point pen tip actually an ink tip or a capacitive tip? All your pictures only show the round ball rubber tips in action.? I believe there is a technical reason that requires a capacitive tip to have a certain minimum diameter. So I don't believe they CAN make them much less diameter. One reason I prefer the brush stylus is that a regular stylus feels like a crayon, whereas you don't expect a brush to have a fine tip. I'm glad to see we're starting to see competition in the traditional "nib" category for capacitive styli. I heard great things about the AluPen!